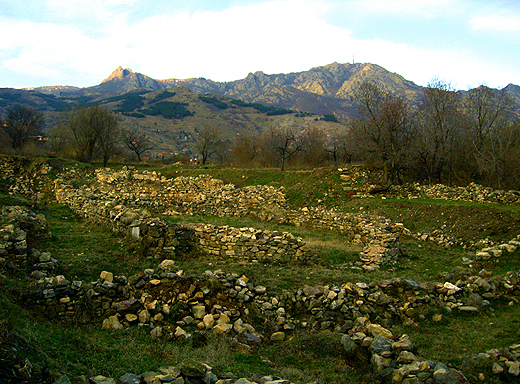 The excavations of the Kaleto fortress near Koshnitsa were started in 2011 but have not been funded by the government ever since, and were terminated. Now the Archaeology Department of the Smolyan Regional Museum of History is applying for funding from the Bulgarian Culture Ministry in order to continue the excavations of the fortress near the town of Koshnitsa in the Rhodope Mountains. It is important to note that in the Bulgarian countryside “Kaleto” (“kale” is a Turkish word meaning “fortress” adopted during the Ottoman period) is a common name given to local fortresses whose name has been forgotten and has remained unknown. The fortress “Kaleto” near the town of Koshnitsa was in use in the Late Antiquity / Early Byzantine period – in the 6th century – and again during the period of the Byzantine occupation of Bulgaria (1018-1185 AD) and the Second Bulgarian Empire (1185-1396 AD), in the 11th-13th century. However, the archaeological excavations conducted there have also shown traces of prehistoric human presence from the Late Chalcolithic (also known as Aeneolithic or Copper Age), the Bronze Age, the Early Iron Age (11th-6th century AD), and the period of Ancient Thrce and Ancient Rome. During the 2011 excavations of the fortress Kaleto near the town of Koshnitsa, the Smolyan archaeologists explored the southern fortress wall and a church where they uncovered the structure but did not dig beneath its floor. “If we get the funding from the [Culture] Ministry, we would like to excavate Kaleto in Koshnitsa for two months over the summer,” says Nikolay Boyadzhiev from the Archaeology Department of the Smolyan Regional Museum of History, as cited by the Bulgarian information agency Focus. He explains that smaller scale excavations at Kaleto were conducted in 2014 as well but only with funding from the s whereas now they hope to be able to carry out major digs with money from the Culture Ministry. The Late Antiquity and medieval fortress near the town of Koshnitsa, Smolyan District, known as Kaleto, is located on a 1006-meter mount of marble and limestone. It is connected with a cave leading into the valley of the Arda River. Archaeological excavations have found evidence that the cave as used as a prehistoric sanctuary while the mount itself was fortified as early as the 5th-4th millennium BC (during the Chalcolithic (also known as Aeneolithic or Copper Age)). Its site has traces of prehistoric human presence from the Late Chalcolithic, the Bronze Age, the Early Iron Age (11th-6th century BC), and the period of Ancient Thrаce and Ancient Rome. The fortress near Koshnitsa was in use in the Late Antiquity and Early Byzantine period – in the 6th century – and again during the period of the Byzantine occupation of Bulgaria (1018-1185 AD) and the Second Bulgarian Empire (1185-1396 AD), in the 11th-13th century. During the Late Antiquity, the fortress near Koshnitsa guarded major routes within the Rhodope Mountains, namely, the transitional route in the mountains linking the so called Diagonal Roman Road (Via Militaris) and the Roman Road running along the Aegean coast (Vid Egnatia). It has been by archaeologists from the Smolyan Regional Museum of History.